Suntup Editions is very proud to introduce their latest addition to The Covers Collection. The first of two spectacular cover art prints signed by artist Michael Whelan, The Dark Tower: The Gunslinger. This magnificent cover art graced the first US edition cover of The Dark Tower: The Gunslinger by Stephen King, published by Donald M. Grant in 1982. This is the second piece of artwork Whelan was commissioned to create for King. According to the author’s web site, King was so impressed with Whelan’s work the first time around that he suggested him for The Dark Tower: The Gunslinger, the first book in The Dark Tower series. Whelan’s cover art depicting Roland and Jake in their escape from the Slow Mutants only appeared on 20,000 copies of the trade hardback — its first and second printings. By the third printing, the cover art was changed. The Dark Tower: The Gunslinger is widely considered to be one of the most sought after books by Stephen King collectors. This officially licensed print went through several rounds of color corrections with the artist to make sure that it is as close to the original as possible. Now, you can enjoy Michael Whelan’s dazzling artwork presented here without cover text. 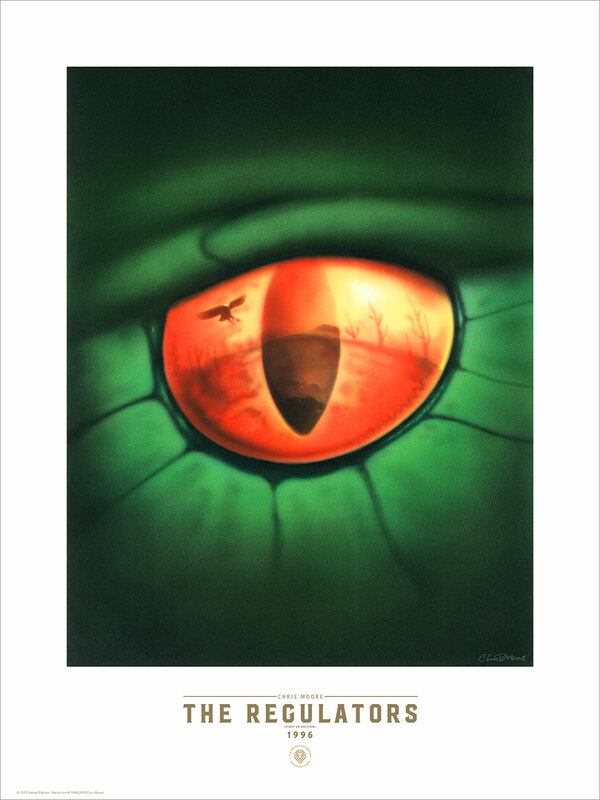 These prints are hand-signed by Michael Whelan and limited to just 50 copies per size, worldwide. – Limited to only 50 copies of each size worldwide, plus 3 Artist Proofs and 3 Publisher Proofs for private distribution. Suntup Editions has revealed another beautiful bonus print in The Covers Collection from the late Don Brautigam. This month, they have one of the highest anticipated and most requested covers, the art from the first US edition paperback of Night Shift. The 1979 Signet paperback release of Night Shift features the first of many covers Brautigam would be hired to create for Stephen King. It is also one of his most iconic. The imagery of the eyes peering forth from the bandaged hand was inspired by King’s short story “I Am the Doorway,” which is included in this, his first ever short story collection. A unique characteristic of the Night Shift first edition paperback is its stepback, or keyhole cover. Subsequent printings would reuse Brautigam’s artwork, but the first edition is identified by the outermost front cover’s “keyholes,” which open up to a full page color stepback graphic underneath. Now, this magnificent piece of artwork can be enjoyed for the first time without cover text as a beautiful giclée print — and you don’t even need to line up the eyes! – Authorized by Dan and Jim Brautigan. Suntup Editions has announced The Regulators by artist Chris Moore as their latest addition to The Covers Collection. After the original of this piece was sent to the publisher, it was never returned to artist Chris Moore and has been considered lost for many years. Since there was no original art to scan, Chris suggested that he repaint the entire piece from scratch. Now, you can enjoy The Regulators cover art presented here for the first time without text as a fine art giclée print. Suntup Editions is delighted to announce that The Long Walk is their latest addition to The Covers Collection. This iconic and memorable artwork graced the cover of the 1st U.K. paperback edition of The Long Walk by Stephen King, writing as Richard Bachman. This beautiful cover art is now presented here for the first time as a beautiful Giclée print of the full cover art, without text, so you can experience this piece like never before. 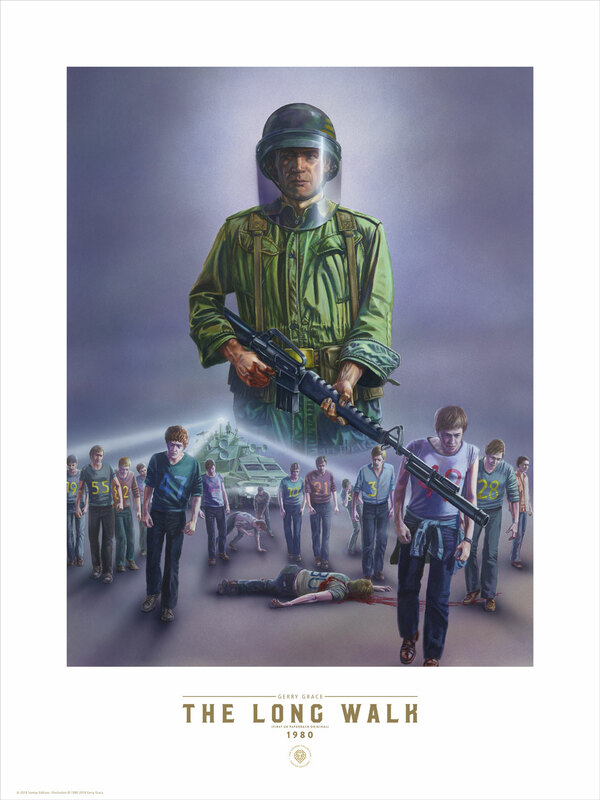 Order your individual fine art print signed by artist Gerry Grace, or become a subscriber to The Covers Collection and receive a new print every month featuring the iconic cover art from Stephen King’s novels. – Limited to only 50 copies of each size worldwide, plus 5 Artist Proofs and – 5 Publisher Proofs for private distribution. – Printed on 300 GSM, 100% cotton paper that is Acid-Free, Lignin-Free, – Chlorine-Free and with No Optical Brighteners. Suntup Editions is excited to announce their first release in “The British Invasion” series of The Covers Collection. Kicking off this series of U.K. covers is IT by Gerry Grace. This iconic and memorable artwork graced the cover of the 1st U.K. edition of IT by Stephen King. 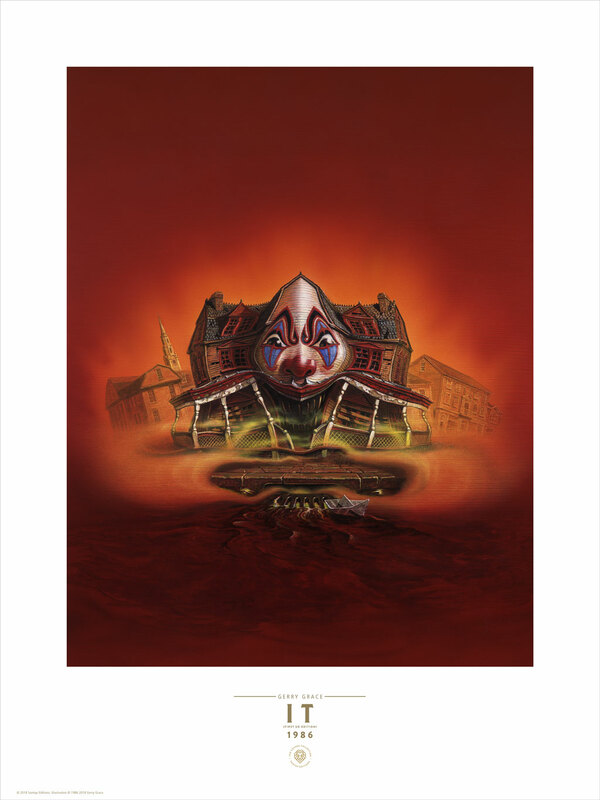 Gerry’s depiction of the house on Neibolt Street morphing into Pennywise the clown is one of the most unique and startling images from the cannon of King cover art – the stuff nightmares are made of! 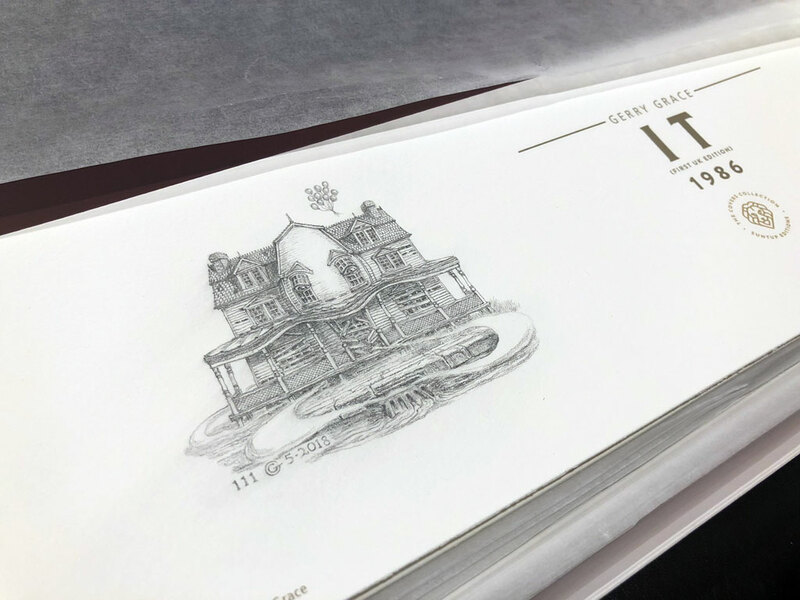 These prints are hand-signed by Gerry Grace, who has created some spectacular Remarques for this print — three of which are available for purchase at the time of the release, so act fast on those. Exclusively available through Suntup Editions for your private collection, and limited to just 50 signed copies per size, worldwide. – Limited to only 50 copies of each size worldwide, plus 5 Artist Proofs and 5 Publisher Proofs for private distribution.